As mentioned in part one of my adventures, one weekend in Tucson was too much fun for one post; here’s part two! Before I go any farther, while researching the shop where I saw the quartz sphere to your right, I found that someone made a video of it. It’s much more impressive in motion; none of my photos really captured how cool it was. 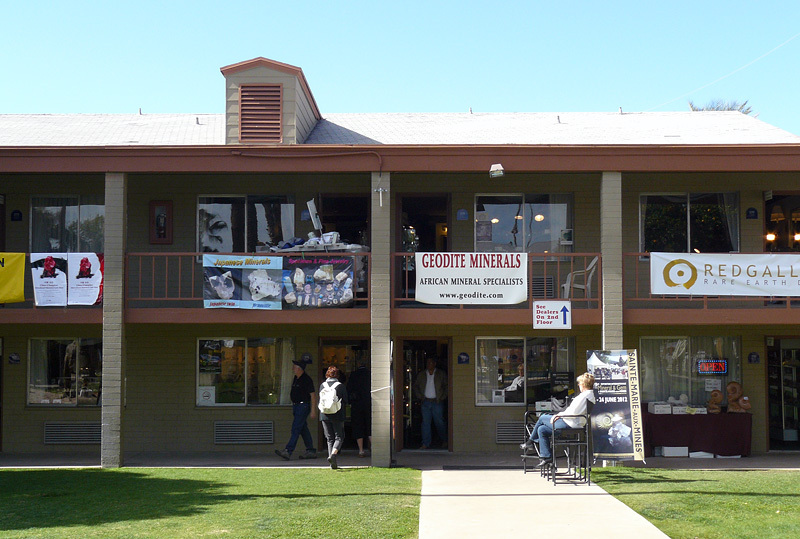 Saw this at Fine Minerals International, around the corner from Hotel Tucson City Center. Think bowling-ball size? Across the street from the AGTA GemFair was the Gem and Jewelry Exchange, another wholesale show that I had been advised would be “colorful”, with many foreign vendors. Armed with my AGTA badge, I was able to exchange my business card for a GJX sticker, and waltz right in for free. Note to self: business card = legitimacy. Never mind that any idiot can have a business card printed… myself most certainly included! Unfortunately, GJX had a large “no photography” notice at the door. GJX was quite different from AGTA. While browsing a dealer of included quartz, I cheerfully haggled with an Italian man whose span of English was the word “OK?” If I picked something up for more than a second or two, he would take it from my hand, calculate a price, and show me the calculator, saying “OK? OK?” If I took the stone back, or started browsing again, this process would repeat, resulting in a lower price. Eventually I caved and bought two stones (for the original price of the first stone.) It was too fun! I stopped by the booths of two faceting rock stars. The first was John Dyer, gemstone artist extraordinaire. 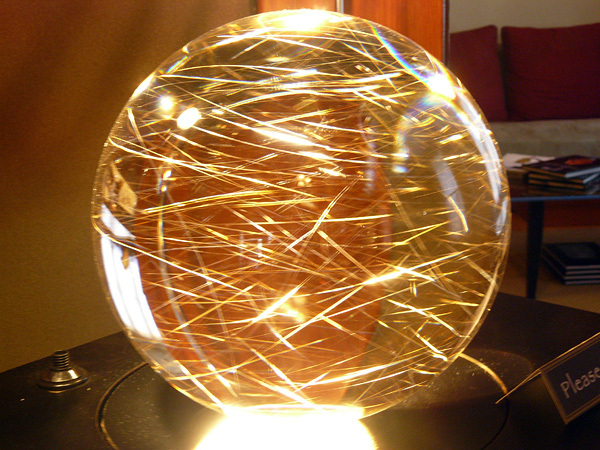 Mr. Dyer is self-taught, and has earned almost 40 faceting awards since 2002. He and his adorable wife Lydia were working the booth, both bubbling with enthusiasm (and who wouldn’t be, given the stones they were showing? GORGEOUS stuff.) 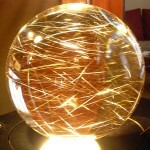 I love what he does with ametrine. A hotel turns into multi-level rock shopping! In the courtyard by the pool, and out front, animatronic dinosaurs hung out and roared at passers-by. I went on Sunday morning, and returned in the afternoon, which ended up being perfect timing, as the crowds cleared as soon as the Superbowl started. (Huzzah, a whole rock show mostly to myself!) I saw some amazing meteorites, and a lot of beautiful pallasites. There were many vendors dedicated to minerals from a specific locale (Russia, Ethiopia, etc), which were fascinating to browse through. There were tents and tables set up in practically every empty lot in Tucson (that’s how it seemed), and I walked through some of them on “Hotel Row”. I walked into one tent and saw a fully-articulated mammoth skeleton, and a triceratops skull sitting on the ground. Other places had beads, finished jewelry, rough material, anything you could imagine. 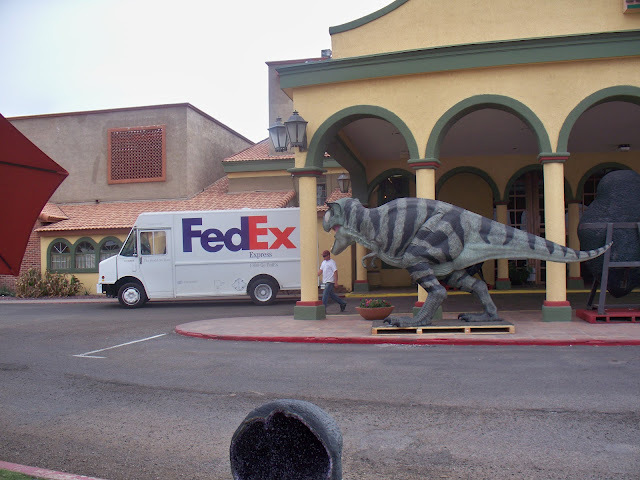 Dinosaur at the front entrance - look out, FedEx guy! Photo by Robyn Hawk. 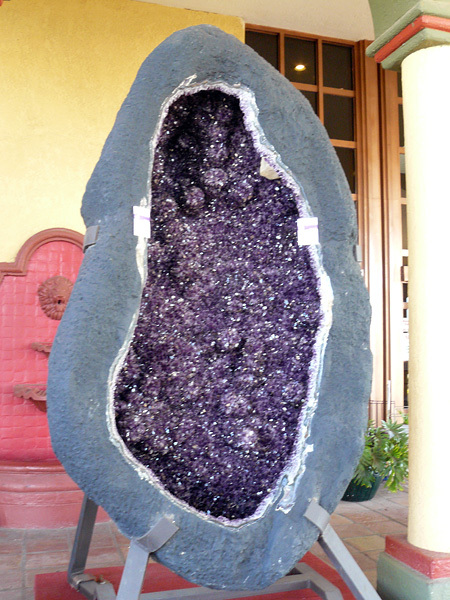 Amethyst cavity, 8-10 feet tall? 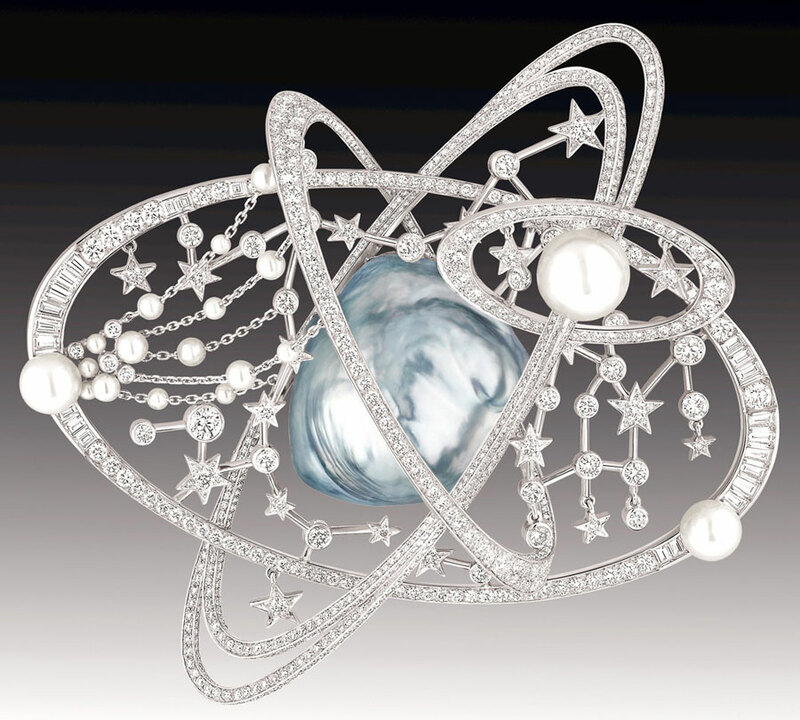 Chanel Céleste brooch in white gold, diamonds, and pearls. One of a kind. 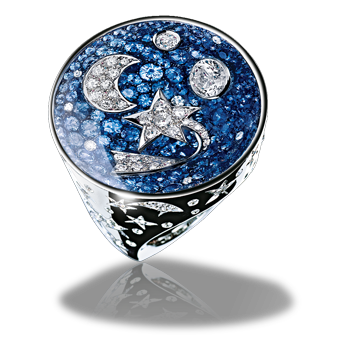 Chanel Comète Ring in 18K white gold, sapphires, diamonds, and sapphire crystal. "Price upon request." Launching the Comète line are some amazing one-off pieces, in celebration of the 80th anniversary of Gabrielle Chanel’s 1932 Exhibition de Bijoux en Diamants. These pieces will tour the world in a traveling exhibition — this article has more photos. Of the one-of-a-kind pieces I’ve seen, my favorite is the Céleste brooch above. 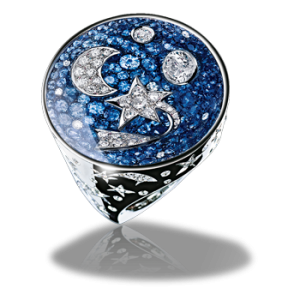 The soft colors, the combination of glowing pearls and sparkling diamonds, and the design elements (stars! rings! planets!) are hitting me in all my vulnerable spots. This piece has me palpitating. From the Comète line, I adore the sapphire and diamond Comète ring (available, but “price upon request.” Eep.) I can’t fathom how something like that is created, but I LIKE IT. I LIKE IT A LOT. In conclusion, all the starry things are gorgeous. I hope you agree!